The Eunice Fisher Distinguished Hybridizer Merit Award is given in recognition of outstanding achievement in hosta hybridizing to a member of the Society who has truly advanced the genus Hosta. 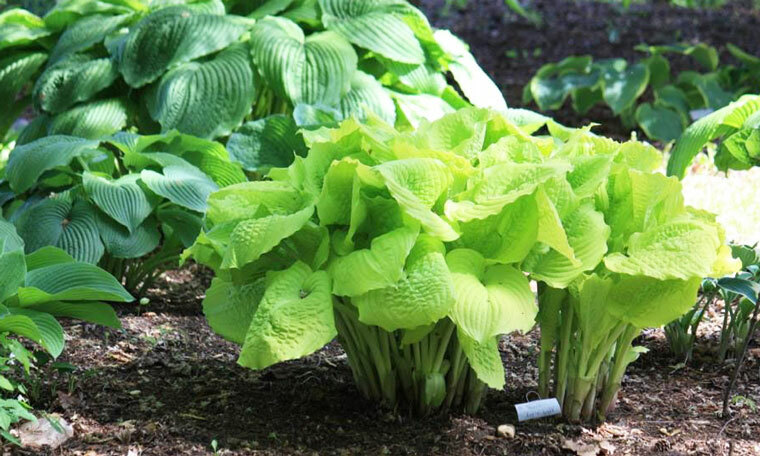 Olga Petryszyn, The Hosta Lady, is famous for introducing very large hostas that she nurtures over many, many years from tiny seedlings to striking garden plants. 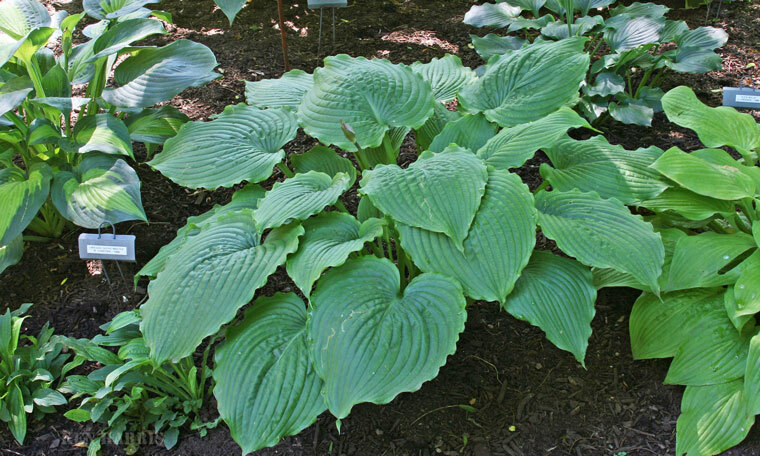 She has registered 25 hostas, all hybrids, and most of her introductions are named for features of American Life and landscape. They include Hosta ‘Blue Hawaii’, ‘Chesapeake Bay’ and ‘Mardi Gras’. 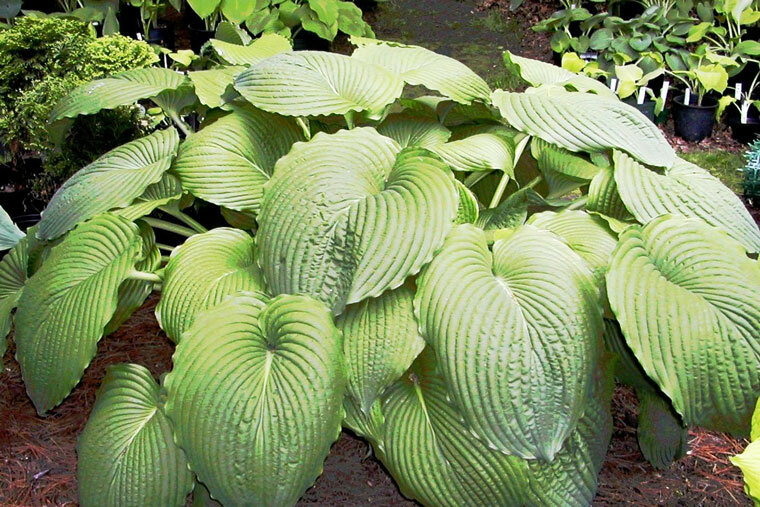 In 2012 her ‘Niagara Falls’, won the fourth Benedict Medal, the only hybrid hosta to be given the award thus far. H ello everyone. I AM JUMPING FOR JOY. 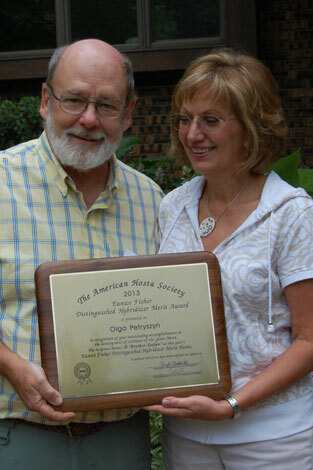 Thank you, The American Hosta Society and those on the nominating committee. This honor should really go out to all of you who continue to support the genus hosta. Hosta ‘All That Jazz’, ‘Coal Miner’, ‘Dawn’s Early Light’, ‘Golden Gate’, ‘Gone With the Wind’, ‘Great Plains’, ‘Key West’, ‘Manhattan’, ‘Old Faithful’, ‘Mardi Gras’, ‘Mount Baldy’, ‘Tobacco Road’, & ‘Yosemite Valley’. Sparks created by events and people in our lives grab our attention at a very early age. Events that we never forget. My plant passion started as a child. If I may, I’d like to share some of my past, so you can get to know me a little better. 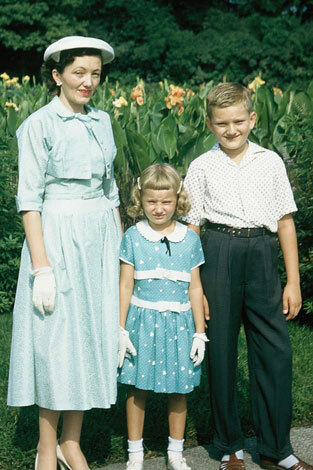 My mother, Anna, and father, John, were hard working immigrants from the Ukraine. They were captured as prisoners of war and forced into slave labor camps in Germany. They lost their first child, Irene, and had a second child, Stefan, at the war's end. My family of three was sponsored by a Mennonite couple to be brought to the United States and given work on their farm in Illinois. The Albrecht’s loved to say ‘everything is a discovery’. I was born soon after. Here I learned a lot about growing and nature. American Dream. Father was a shoemaker and Mother a seamstress. My brother was soon charged with extra responsibility when father died at the young age of thirty-four. Mother barely spoke English and carried two jobs, keeping up with a mortgage on a two flat they had just purchased. Yet mom and I spent time in the vegetable garden. Soon I graduated to tend the flower garden, learning about weeds first. My real excitement was the seeds. It was the seeds that held the promise for the flowers that I loved to share. I did neighborhood chores for the ladies on our block to earn seed money. Seeds were planted everywhere I could find space. Does that sound familiar? Careful attention was paid to the earthworm, the pollinating bees and butterflies, the colors, the scents, the sounds of the frogs and even the death. These were my sparks. Mother’s teachings added to my passion for growing things and sharing. My brother was always there to keep my out of harms way and be with me to celebrate special occasions. He’d give up a chance to play ball with his friends to sit with me through yet another game of Cootie or Monopoly when I was sick. He never complained. When I was old enough, I played softball with his buddies and none of them dared to make fun of me. After church we were made to pose for yucky photographs. Mom was proud of us in our good clothes that she made. More occasions passed … Holy Communion, graduation, prom and we even double dated with his boyfriends. My son John has an influential Uncle to look up to. Stef went on to the East Coast becoming a successful aeronautical engineer and did amazing things to protect our country. He volunteers to teach under privileged children about engineering, supports special needs groups and is on educational boards. 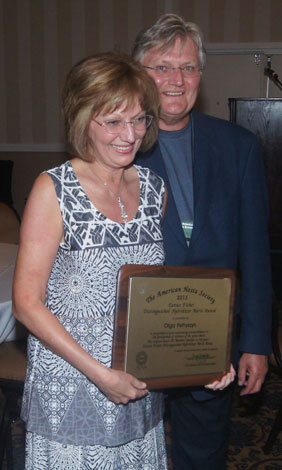 My parents, brother and family sponsors, the Albrechts, were my early mentors, honoring the U.S. of A. This is the reason for my Americana Series of Hosta. Mom passed away at the age of fifty. My darling son John was four. Then my first Hosta mentors came into my life, Bill Brincka and Basil Cross. I had known Bill as one of my instructors at the School of the Art Institute of Chicago. After spending time working and playing in their Indiana garden, I was convinced to move to Indiana as well. 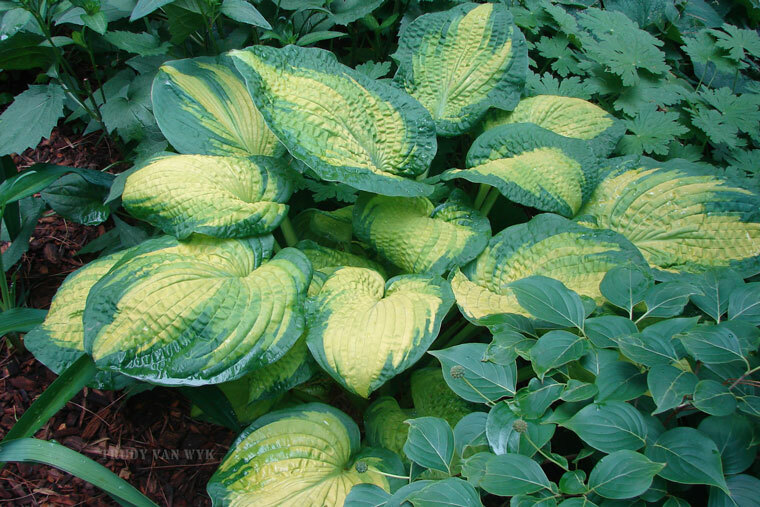 When I fell in love with the hosta plants, Bill taught me how to hybridize them. I used their plants to hybridize and even planted seeds that were on hostas that Mildred Seaver sent to them. I dreamt of crosses and collected seeds that were planted in my basement over winters. My heart burst with excitement when they came to life. My fond childhood feelings were back. My patience taught me to wait many years before the final cull and choice. Just last weekend my friend, Hans Hansen, emailed this picture. A 2000 cross of a Herbaceous Peony with a Tree Peony. Patience of 12 years rewarded him with this beautiful flower. Patience is key, a tough thing to teach in today’s world. In 1990, Bill and Basil came to my garden and gaped when standing in front of 'Niagara Falls'. Bill said, ‘THAT HOSTA IS GOING TO PUT YOU ON THE MAP’. He was clairvoyant that way. Basil named it. Life with them was always a party, and I really miss them. Again my sparks flew to fuel my underlying passion to grow beauty in honor of my family and the United States of America. 2004 brought a wonderful change. 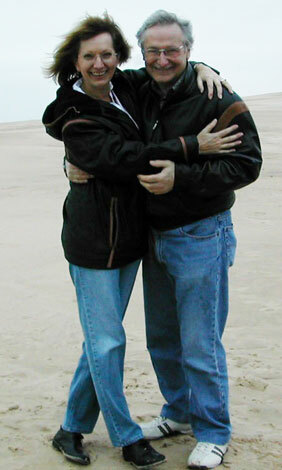 The love of my life, Lew Myers, and I were married. Basil created a beautiful garden wedding for us. Lew was pretty surprised when he saw my sea of hostas. I will never forget when he first saw all the raised beds and asked, ‘Are all these yours?’ There was momentary panic. He helps with all the heavy work. Strength is good. If I need a hole dug for a monster-sized hosta, I have to stop him before he digs to China. I could never thank him enough for his unwavering love. Hosta lovers are so willing and kind. They absorb information and have a passion to share and give in the name of Friendship first and the Hosta second. There are so many jewels of tips and ideas, even cupcake recipes you go home with. I love seeing hybridizers blossom. When judging shows, I see how a hybridizers line of work is taking shape like the Stegeman’s. It’s wonderful to see a friend win at the head table like the Schroeder’s. I just saw on Facebook a picture posted by Mike Groothuis. I was privileged to be one of his mentors. It was a seedling he got from me 21 years ago that he uses in his breeding program. How about that. Someone said it looked like thunderheads. Mike is creating some amazing hostas. Hybridizing has taken a quantum leap, so far ahead from when I started. If you wanted a new hosta you had to see what letter came in the mail, probably from Hatfield Gardens. It was Xerox copy, no pictures and you paid a great deal for them. This was before tissue culture. Last year at a real estate open house my cell phone rang. Ducking around the corner I hear Jeff Miller at the other end. 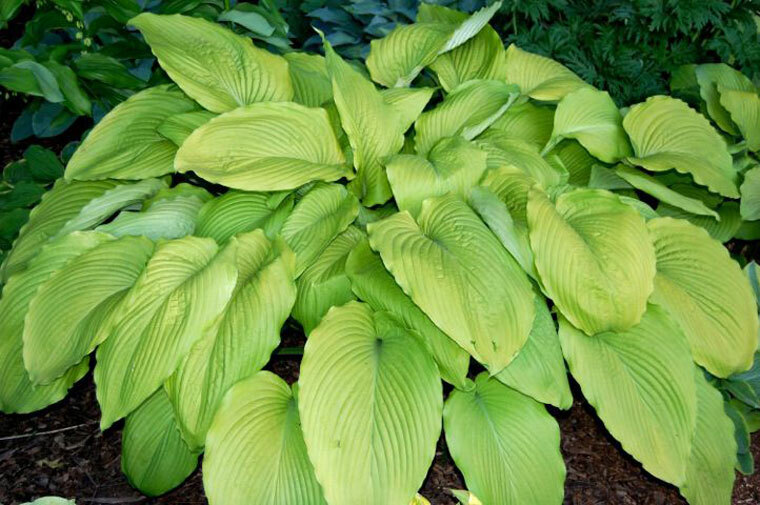 ‘I just had to call you and thank you for the hostas you are giving us.’ Facebook pages are filled with statements to me like ‘You are a good friend and mentor who truly steered me in the right direction over the years, pushing me to fulfill my interest in hybridizing’. Another was ‘You gave me the tools and know how to do it right and I ran with it, even though you may not realize you did’. Or, ‘We are all benefactors of your hard work as is the entire plant world’. Wow. I say no, it’s YOU WHO ARE DOING AMAZING THINGS. Tears fill my eyes to think that you see me as a muse and mentor. I challenge and encourage all hybridizers and gardeners to reach out and see who shows signs of the spark. Embrace them and share. Start them early. That is your responsibility in the perpetuation of the lowly Funkia who became the beautiful Hosta Swan. Tonight I’m asked to name my favorite hosta. Even though as hybridizers we know how difficult this is, I did not hesitate to think of who I carry in my heart. The one who is named for my favorite mentor, my all American Hero and brother. I name and honor H. ‘Brother Stefan’.